(AINA) -- All over the world, Assyrians, Armenians and Pontic Greeks are remembering the victims of the genocide perpetrated during World War One, where the Christian population of Asia minor was annihilated systematically by the so-called Young Turk government. While Assyrians call the genocide Seyfo (Sword), Armenians refer to the events as Aghet (Catastrophe). In worldwide initiatives, Assyrians too work for the recognition of the genocide that Turkey still denies. Most recently, the Swedish Parliament recognized the genocide (AINA 3-12-2010), calling on Turkey to acknowledge it. Turkey as the legal and political successor state of the Ottoman Empire vehemently rejects calling the killing genocide according to the U.N. definition adopted in 1948, insisting that those killed were victims of war and uprising. In a statement issued by White House on the 95th anniversary of the genocide, U.S. president Barack Obama marked the WWI era massacre by Turkish forces, calling it one of the worst atrocities of the 20th century, but avoided any mention of "genocide." He said: "On this solemn day of remembrance, we pause to recall that 95 years ago one of the worst atrocities of the 20th century began. In that dark moment of history, 1.5 million Armenians were massacred or marched to their death in the final days of the Ottoman Empire". Triggered by an adopted resolution H. Res. 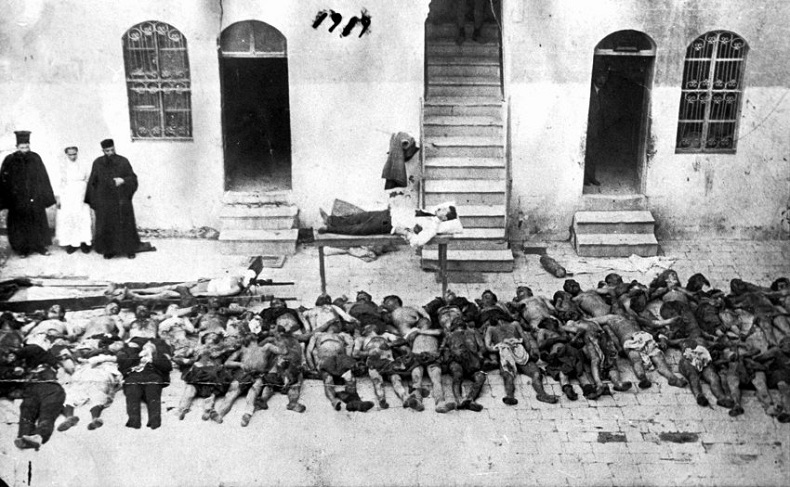 252 of the U.S. House of Representatives committee in March 2010 to call the 1915 killings a genocide in accordance to the U.N. definition, most media attention and political debates, like in previous years and decades, are doubtless on the Armenians. This is legitimate in view of the tireless efforts of the Armenian lobby working for the recognition of the Armenian genocide. Sadly, for decades the fact that Assyrian as well as other Christian groups fell victims has been unknown or ignored, even though the historical record on the Assyrian suffering in the same manner as the Armenians did is clear and documented by overwhelming evidence. They are proven by foreign office records of the United States, France, Great Britain, Russia, and of Turkey's World War I allies, Germany. Such important evidence is for example included in the collection of Arnold Toynbee, "On the Treatment of Armenians and Assyrian Christians by the Turks, 1915-1916, in the Ottoman Empire and in North-West Persia." This became a part of the "British Blue Book" which was presented to the English public by the English State Secretary for Foreign Affairs, Viscount James Bryce. However, the book appeared as The Treatment of Armenians in the Ottoman Empire, London 1916, and failed to name the Assyrians in the title. According the German historian Dr. Gabriele Yonan, of the 684 pages in this book, 104 pages refer to the massacres of Assyrians in Azerbaijan and Hakkari (Chapter IV). Chapter IV was left out in the French translation published in 1917. "It apparently seemed opportune at the time to restrict the documentation to the persecution of the Armenians, just as the title suggested," states Yonan in her book (Ein vergessener Holocaust: Die Vernichtung der christlichen Assyrer in der Türkei., Society for Endangered People, Göttingen, 1989). In a second edition which was published in 1972 in Beirut, Chapter IV was once again included, as in the English original edition. In 1989 these documents were published for the first time in German translation in Ein vergessener Holocaust. In Early April the German state television broadcast a 90 minutes documentary dedicated to the Armenian Genocide (Aghet) and based on contributions of eyewitness, diplomats, missionaries and played by top actors. The documentary showed what motivated the murderers and why Germany, and other countries, remained silent. Despite the excellent research and quality of the documentary, non-Armenian victims were unfortunately not mentioned at all. Until today, the Assyrian genocide remains in the shadow of the Armenian genocide, even though the Assyrians existence was similarly threatened and their population was decimated. Estimates are that 750,000 Assyrians of different denominations became victims of the planned killings. Meanwhile, ample scholarly written material on the Assyrian genocide has appeared and in 2007 the International Association of Genocide Scholars (IAGS), which has recognized the 1915 Armenian genocide, extended the recognition to also include the Assyrians and Pontic Greeks (AINA 12-15-2007).